For all ESL levels, 1 and up. Banks are probably not exactly the same in the United States as they are in your country. This video will help you understand American banks and banking words. You do not have the worksheet and homework from the video, but you can still practice. Click here to download a practice worksheet. Do you have a bank account in the United States? What kind? Are banks in the U.S. similar to banks in your country? Do you think that everyone should have a bank account? Why or why not? With a partner, practice asking and answering these questions about Easter. For each one, “Q” means question, and “A” means answer. Take turns asking and answering the questions. 1. Q: What is Easter? A: This year, Easter is on Sunday, April 5th. 2. Q: What is Easter? A: Easter is an important Christian holiday. It celebrates the resurrection of Jesus. 3. Q: What does “resurrection” mean? A: “Resurrection” means returning to life. Christians believe that Jesus died and returned to life. 4. Q: What do people say on Easter? 5. Q: How do people celebrate Easter? A: People celebrate Easter by going to church, eating a special meal with family, and coloring eggs. 6. Q: Why do people color eggs for Easter? A: The egg is a symbol of new life. 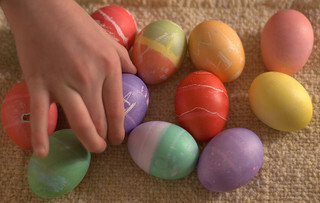 In many spring festivals, people color and decorate eggs. Then they give the eggs to friends and family. Christians believe that Jesus gives them new life. 7. Q: What is an Easter egg hunt? 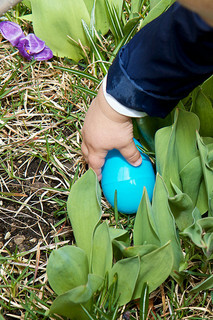 A: An Easter egg hunt is a game for children. Adults hide Easter eggs, and the children find them. Often, the eggs are plastic and have small toys or candy inside. 8. Q: What is the Easter Bunny? A: The Easter Bunny is a holiday character like Santa Claus. Santa brings gifts at Christmas, and the Easter Bunny brings gifts at Easter. Most American children believe in Santa Claus, but many American children do not believe in the Easter Bunny because their parents do not tell them that the Easter Bunny is real. 9. Q: What is Holy Week? A: Holy Week is the week before and including Easter. It begins on Palm Sunday and ends on Easter Sunday. 10: Q: What is Palm Sunday? A: Palm Sunday is the Sunday before Easter. On Palm Sunday, Christians remember the day when Jesus arrived in Jerusalem. 11: Q: What other important days are in Holy Week? A: The other important days in Holy Week are Maundy Thursday and Good Friday. 12. Q: What is Maundy Thursday? A: Maundy Thursday is the Thursday before Easter Sunday. On Maundy Thursday, Christians remember the the last meal that Jesus ate with his friends before he died. After this meal, his friend Judas took soldiers to Jesus, and they arrested him. 13. Q: What is Good Friday? A: Good Friday is the Friday before Easter Sunday. On Good Friday, Christians remember the death of Jesus. 14. Q: Why is school closed on Good Friday? A: Good Friday is a state holiday in North Carolina. Government offices, courts, post offices, public schools, and some banks are closed on state holidays. 15. Q: What can I do in Raleigh for Easter? Take turns asking and answering the questions with your partner. Ask your teacher to help you with your pronunciation. Make a video of your class talking about Easter! This week, we’re going west to the Grand Canyon. A canyon is a very long, very deep hole in the earth. Usually, there is a river at the bottom of the hole. Over time, the water in the river carries away the dirt from the land and digs deeper into the earth. Over a very long time (many, many, many, many, many years), the river digs so far down that a canyon forms. A canyon has high, straight walls. The Grand Canyon is the largest canyon in the United States and one of the biggest in the world. It is not the deepest canyon, but it is very deep – 6,000 feet (1.8 km) at its deepest point. Do you want to know more about the Grand Canyon? Listen to this, and try to answer the questions below. 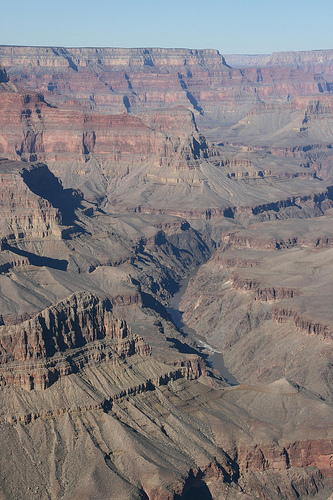 Where is the Grand Canyon (which state)? What formed the canyons in the south-western part of the United States? What is the name of the river at the bottom of the Grand Canyon? How long ago did the Grand Canyon begin to form? What kinds of rock can you find in the Grand Canyon? When did Native Americans live in the Grand Canyon? Name 3 Native American tribes that have lived in the area? For how many months did John Wesley Powell and his group travel through the Grand Canyon? When did tourists begin visiting the Grand Canyon? How many people visit the Grand Canyon each year? How much does it cost to use the Skywalk? How do people feel when they visit the Grand Canyon? Listen again, and check your answers. If you need help with the listening, click here for the script. Check your answers in the comments section! How did you do? Were you able to answer all of the questions? What else would you like to learn about the Grand Canyon? Search the internet for more information, or plan a trip to see it in person! Have you visited the Grand Canyon? Tell us about it in the comments! Oh students, this week I have something WONDERFUL for you! It’s a vocabulary and pronunciation lesson about Valentine’s Day, which is on February 14. At the end of this post, you will find a video. The video is a rap song about Valentine’s Day. You can listen to it while you read the words. Then you can practice with the music at the end of the video. Before you watch, though, there are some words you will need to know. Example: My sweetie pie gave me flowers for Valentine’s Day! He’s so sweet! Example: I’m going out of town with my honey for Valentine’s Day. Example: Did you see the beautiful gal I took to the party? Example: Did you see the weird guy at the party who wouldn’t leave me alone? Example: Lauren’s son is the apple of her eye. She loves him more than anything else in the world. Example: Angelina is Brad’s main squeeze. Example: When Andy met his wife, he knew that she was his soulmate. Example: My husband brings me flowers every week and tells me I’m beautiful every day. He’s a really good catch! Example: Kelly thought that she would like Eric a lot because they had many similar interests, but when they met for dinner, she discovered that they didn’t have any chemistry. Example: Are you busy this weekend? Maybe we can catch a movie on Saturday. Example: I’m busy on Saturday night, but we could catch a matinee. Example: Katie has a crush on Jason, but Jason is interested in someone else. Example: Jason is going to ask Phoebe out. Example: When Jason asked Phoebe out, she played hard to get because she wants him to work harder to get her. Example: Phoebe’s love games turned Jason off, so he asked Katie out, and she agreed immediately. Example: Phoebe asked Jason out, but he turned her down because he was dating Katie. Now you’re ready! Watch the video as many times as you want. Practice with the rapper, and then try it on your own. Have fun, and happy Valentine’s Day! Many students know the history of Thanksgiving. Pilgrims (people who left England for religious freedom and new opportunities) moved to the northeastern part of the United States to start a new life. It was very difficult in the beginning, and a lot of people died. However, the British and the Native Americans became friends, and soon, there was enough food for everyone. They celebrated their success for three days in 1621, and that was the first Thanksgiving. The pilgrims probably didn’t eat many of the foods at the first Thanksgiving that Americans eat now. They probably did not have turkey, pumpkin pie, or potatoes! George Washington announced the first national Thanksgiving holiday in 1789, 168 years after the pilgrims celebrated the first time. In 1829, a woman named Sara Josepha Hale started writing letters to the president because she wanted Thanksgiving to be a national holiday. At that time, each state decided when it would celebrate. She wrote letters for 30 years! She wrote letters to at least five different presidents. Finally, in 1863, President Abraham Lincoln announced that the whole country would celebrate Thanksgiving on the final Thursday in November. This happened during the Civil War, and President Lincoln was trying to keep the country together. Maybe he hoped that a national holiday would help everyone feel united again. In 1939, President Franklin D. Roosevelt made Thanksgiving one week earlier. This was during the Great Depression, and Roosevelt wanted to give people more time to shop for Christmas presents so that businesses could get more money. In 1941, Roosevelt officially changed the day of Thanksgiving from the last Thursday in November to the fourth Thursday in November. Every year, the president pardons (forgives, or gives no punishment to) a turkey on Thanksgiving. That turkey gets to retire on a farm instead of being eaten by a family. This video includes all of the information I just gave you. Watch, listen, and see how much you can understand. The answers to these questions are also in the video. Write a comment, and tell us which ones you heard! How many deer did the Indians kill to give as gifts to the colonists? What do we call the meat of a deer? How did the pilgrims eat cranberries at the first Thanksgiving? Why did Sara Josepha Hale want to have a Thanksgiving celebration? Name 3 recipes written by Sara Josepha Hale. How did people feel about President Roosevelt moving the date of Thanksgiving? Who was the first president to pardon a turkey? NO ESL CLASSES ON TUESDAY, NOVEMBER 11!! Seven months before World War I ended, the fighting stopped on November 11, 1918. That day was called Armistice Day because an armistice is an agreement to temporarily stop fighting a war. This day was remembered and celebrated for several years as Armistice Day, which became a national holiday in 1938. However, after World War II and the Korean War, Americans felt that the holiday should celebrate all American soldiers, not just those who fought in WWI. Therefore, in 1954, President Eisenhower signed the legislation that changed the name of the holiday from Armistice Day to Veterans Day. Every year, on November 11, Americans take time to appreciate and thank all the members of our armed forces – Army, Air Force, Marines, Navy and Coast Guard. We celebrate our soldiers with parades, speeches, flowers placed on the memorials and graves of soldiers, and of course, a day off from work or school. Every year in America we honor mothers on the second Sunday of May. Not every country celebrates it on the same day (i.e. Mexico celebrates it on May 10) but many countries have a similar holiday. Across the world it is a day that we want to make Moms feel special and let them know how much they are loved and appreciated. On Mother’s Day, we usually send or give our mothers cards, flowers and other gifts. Often, family members will prepare breakfast for “Mum” so she can stay in bed a little longer. Restaurants are VERY busy that day as families treat their mothers to a delicious lunch or dinner. However you celebrate, be sure to let your mother that how much you love her. It will be better than any other gift you can give her. If your mother is no longer living, take a moment and remember the many memories you have of her. Perhaps do something that she taught or shared with you ( like making her recipe for a favorite dish) and keep her with you forever. For more information on this holiday, click on the EL Civics’s Lesson. You know we love you so! At the end of this month, Americans will celebrate Halloween. Halloween is celebrated in many countries throughout the world. This video explains how Americans celebrate Halloween. For advanced reading practice, here is an article from How Stuff Works that has a lot of great information. And if you just can’t get enough, here’s another one. How do people celebrate Halloween in YOUR country?